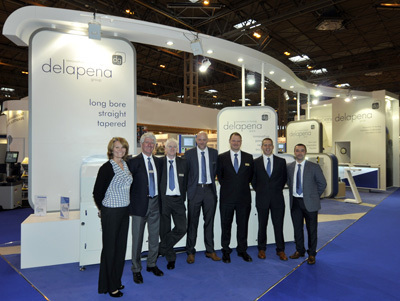 Specialist honing equipment manufacturer Delapena, has reported that its multiple launches at MACH2014 were highly successful and should lead to significant future business: According to Delapena, the company had double the number of inquiries compared to the previous show, with over 50 per cent entirely new contacts. This it asserts is due to the impact of its quadruple launches, including two new honing machines, a new specialist oils business and an abrasives division. PrecisionHone (E3000S) was reportedly another attraction at Delapena, a vertical honing machine designed for low to high volume manufacture of parts ranging from small scale to heavy components. It holds tolerances down to a micron, with sub-micron adjustment and has a honing capacity from 1.14mm to 80mm diameter (subject to application). Delapena not only attracted potential buyers at MACH2014, but also had inquiries to represent the company from interested parties in Russia, Mexico, Middle East and Germany. This, says Martin Elliott, fits well with Delapena’s plans for rapid international expansion and may allow the company to develop further its network of distributors and agents around the world.